Conceived in an era of digitization and automation, self-driving car market has been traversing toward transforming mobility practices across the globe. In fact, the advent of self-driving car is one of the transformative technological shifts that has been promoting a smarter, cleaner, and fast-moving mode of transport. Considering the benefits of self-driving car, several regulators have been implementing supportive policies to increase the deployment of self-driving vehicles that are ultimately becoming helpful to resolve the issues related to the traffic congestion, road fatalities, and pedestrian safety. The surging acceptance for self-driving vehicles along with the demanding future of self-driving vehicles have been enforcing automakers to strongly focus on the enhancement of technology used in the vehicles. The constant involvement of tech giants in the betterment of technology is slated to boost the self-driving car industry share over the years ahead. Currently, most of the automakers have been enlisting the help of renowned IT companies to address the potential of upcoming variants of vehicles. Few days before, Volvo declared that it will use Nvidia’s technology platform for its next-generation vehicles and to monitor the vehicle’s environment. Nvidia’s newly developed software and hardware is touted to maintain the level 4 of autonomy in cars. Aided by intense research and development activities, automakers have been looking forward to introducing the cars equipped with the level 4 autonomy by the end of 2022 for commercial usage. On the other hand, technology companies are also looking forward to investing in the development of myriad self-driving vehicles. For instance, the self-driving vehicle tech division of Intel, Mobileye is planning to launch self-driving car service in Israel. By entering into the self-driving car market, Intel is looking forward to targeting its rivals including Nvidia and AMD which have been providing services to prominent automakers since last few years. In India, leading IT companies have been collaborating with renowned automakers and startups to develop self-driving vehicles. Companies like Tata Consultancy, Cognizant, HCL Technology, and Tech Mahindra have signed short-term as well as long term agreements with approximately more than 40 companies comprising Ford, Audi, and Continental. HCL also has been investing in the development of cameras, sensors, self-learning navigation platform, new-technology braking systems. A technology company like Intel has been striving to educate engineers from IIT-Kharagpur and IIT Madras to improve research and development activities. The direct involvement of technology magnates toward improving the autonomy level of the vehicles is thus poised to fuel self-driving car industry. In order to curb the increasing rate of road accidents, most of the countries have been deploying stricter policies toward the adoption of self-driving vehicles. Though there have been cases of road fatalities since the last few years, vehicle manufacturers and regulatory bodies have been consistently working on it to resolve the limitations of vehicle’s functionality, by holding periodic testing programs for the vehicles. In China, Ford and Baidu have recently signed an agreement to build a testing platform for self-driving vehicles. In fact, they are planning to achieve the level 4 autonomy by running the self-driving vehicles within specific areas over the coming two years. Ford is also looking forward to collaborating with Mercedes-Bez to test cars in Beijing. In another instance, the self-driving car division of Alphabet, Waymo received a grant from U.S. government to test fully self-driving vehicles on the public streets of California. Waymo is one of the first companies which has received permission to actually test cars on roads. It is rather overt that the support provided by regional governments will play a major role in impacting self-driving car industry trends. The dedication of automakers, technology giants, and regulators toward the deployment of self-driving vehicles is slated to propel self-driving car market trends over the years ahead. Core companies have been continuously striving to achieve full autonomy for reducing the consequences of pedestrian accidents. 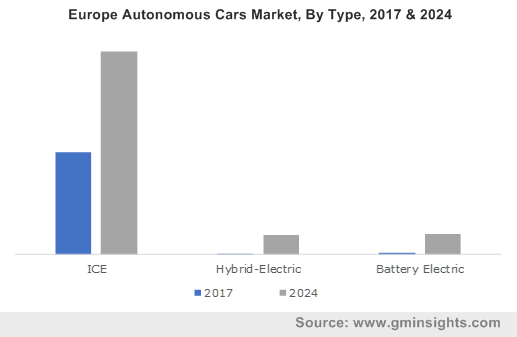 Driven by the shifting focus of people toward the adoption of self-driving cars, the overall self-driving car market will observe a deployment of more than 60 million units by the end of 2024.